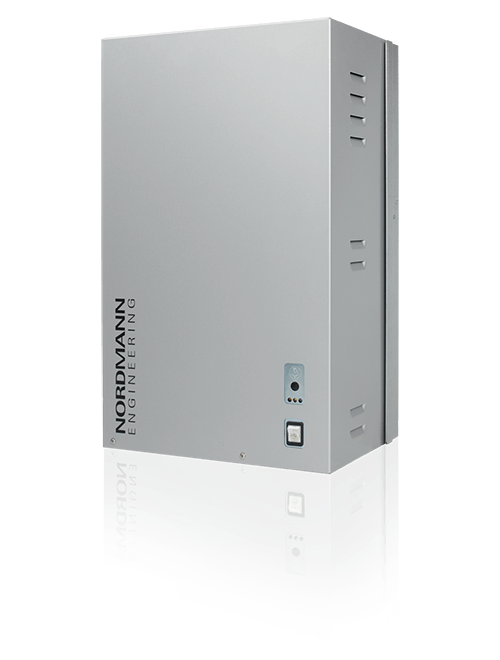 different sizes, the NORDMANN ES4 produces between 4 and 65 kg of steam per hour. Though compact, the ES4 delivers all the advantages of the larger models with 4-kg steam output per hour, a mere width of 28.5 cm and total housing volume of 25 l.
The high-quality finish guarantees a long service life. A robust, hot-dip galvanized housing contains NORDMANN’s time-tested steam cylinder. All in all, an affordable and highly reliable means of generating the steam needed for all types of steam baths. The front flap of the housing is removable, providing convenient access to all components. 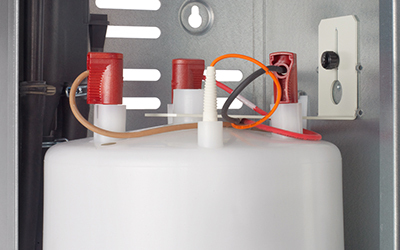 Installation and servicing work is quick and simple. The exchange cylinders are designed for use with ordinary tap water. The extra-large, galvanized electrodes have proved their reliability over many years of practical use. 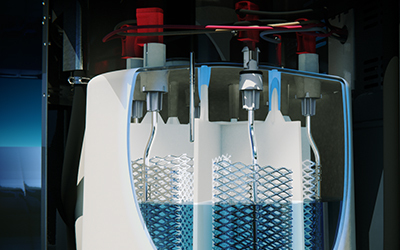 In tandem with the electronically controlled water management system, the steam cylinder adapts perfectly to local water quality.